The Great Lakes Colleges Association (GLCA) has announced the appointment of two Wabash College faculty members – Dr. Warren Rosenberg (English) and Dr. Richard Warner (History) – as GLCA Teagle Pedagogy Fellows. Rosenberg and Warner are among 20 Fellows chosen through a selective process of nomination and application. They are distinguished not just by their knowledge of research on human learning and pedagogical technique, but also by their strong interest in working with faculty colleagues within and across GLCA member colleges to enhance liberal arts teaching and learning. Teagle Pedagogy Fellows will have key roles in the development of a new consortial program, called the GLCA Lattice for Pedagogical Research and Practice, created with funding from the Teagle Foundation. These Fellows will engage with interested faculty members on their own campuses and at other GLCA colleges, helping to generate heightened interest and momentum in exploring different modes of pedagogy to enhance student learning and achievement. "The GLCA Lattice Project is very important," said Gary A. Phillips, Dean of the College at Wabash. "Warren and Rick will well-represent their faculty colleagues and the College in the pedagogical effort. Both believe strongly in the centrality of teaching and of the ongoing work of becoming better teachers. Both are collaborators by nature. And both have the aptitude for working with faculty in ways that brings out the best in those around them — all to the benefit of students." The GLCA Lattice project will connect interested faculty on a given campus to a larger consortial community of interest centered on liberal arts teaching and learning. The Teagle Pedagogy Fellows will help achieve this result in part through a series of campus, regional, and consortial colloquies on pedagogical research and practice. These events will draw together faculty members from different colleges to compare challenges and consider approaches that hold promise in improving learning in the liberal arts, within and across academic disciplines. 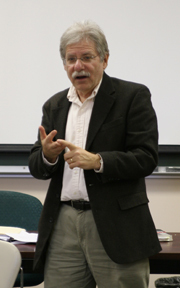 Professor of English Warren Rosenberg (above right) has been an active leader in Wabash's teaching and learning initiatives throughout his career. 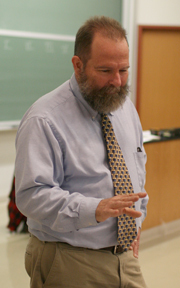 He is in his 32nd year on the Wabash faculty after earning his undergraduate degree in English from Brooklyn, his master's degree from Michigan, and his Ph.D. from the City University of New York. Associate Professor of History Rick Warner (left) joined the Wabash faculty in 1999. He earned his undergraduate degree in history from the University of Vermont, and received a bachelor's degree, master's, and Ph.D. from the University of California-Santa Cruz. He is well known for his innovative teaching style, interdisiciplinary teaching, and immersion learning courses. In face-to-face as well as follow-up digital exchanges, GLCA Teagle Fellows will serve as resources and sounding boards to help other faculty members consider potential approaches to enhance teaching, and in some cases to support formal projects that apply principles from research on learning to the design and implementation of alternative pedagogies. The dialogue among Fellows and their GLCA colleagues will provide a mutual benefit as faculty members of several campuses work to enrich the state of thinking and exploration in liberal arts pedagogy.